Many of you probably remember Baby Doe's Matchless Mine, on Harry Hines, overlooking lovely I-35, behind the famous waterfall billboard. The building is gone now, but the memories remain. The restaurant was named after Baby Doe Tabor, who, through a scandalous marriage, was the wife of Horace Tabor, one of the wealthiest men of the late 19th century. When Horace died penniless, after silver prices dropped as a result of the gold standard, Baby Doe moved into one of their holdings, the Matchless Mine where she eventually died from old age. Back in 1986 I was the DJ down in the mine and became friends with some of the managers. 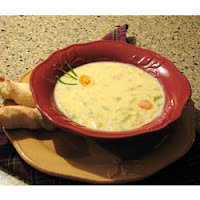 I used to love their beer cheese soup and was able to talk the kitchen manger out of the recipe, but was kind of startled when I saw the ingredients, due to their "cost effectiveness," but you can't argue with great taste. This is a really simple, great Fall/Winter recipe to warm to cockles of your heart. Combine the milk, Tabasco, Worcestershire, and chicken base in a stock pot. Bring it to a boil, stirring frequently. Add the Cheez Whiz, after warming it up in hot water or in the microwave. Mix in well. Dissolve the cornstarch completely in the 1/3 cup of warm water. Add it to the soup, which should start to thicken almost immediately. Reduce the heat a bit and stir in the beer. To serve, ladle into bowls and dust with cayenne pepper and top with some chives. Croutons do quite well in the soup as well. I have GREAT memories of this restaurant and this delicious soup. Thanks for the recipe and sending me down memory lane! I probably danced to spins!